She starred as Lee Israel in the biopic, Can You Ever Forgive Me?. 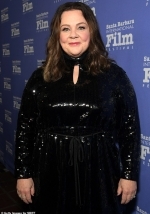 And on Sunday, Melissa McCarthy, 48, and co-star Richard E. Grant, 61, stepped out at the Santa Barbara International Film Festival. That evening, the actress took home the Montecito Award for her role as the writer-turned-literary forger.